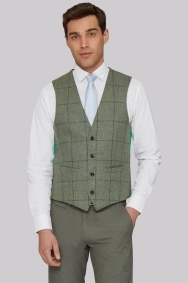 Weave some magic with this multi-check waistcoat. 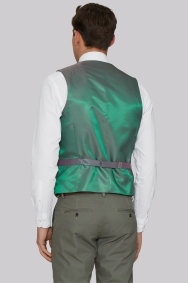 Bold, British and unquestionably brilliant, this luxe green waistcoat from our Moss 1851 range is sure to command attention at your next formal event. Cut from a 100% outer wool fabric and featuring form-flattering style lines, a flat-fronted finish and visually engaging multi-check pattern, this piece brings contemporary refinement to a classical design. Perfect for a modern city gent on a countryside getaway. Wear with a pair of matte green trousers and ivory tie for a sophisticated take on your smart casual apparel.